The nine-box is one of the most widely used tools in succession planning and leadership development. It can be a valuable tool for anyone who works in talent management, or for any manager as a way to assess and differentiate a team or organization. It is usually used to assess individuals on two dimensions: their past performance and their future potential. The X-axis (horizontal line) of three boxes assesses performance, and the Y-axis of three boxes (vertical line) assesses leadership potential. A combination of Y and X axis makes up the box within the grid that each employee is placed in. 1A = High Performance/High Potential, 3C = Low Performance/Low Potential, 2B = medium performance/medium potential, etc. Picture the old Hollywood Squares game show or the introduction to the Brady Bunch, with each character sitting in one of nine boxes. 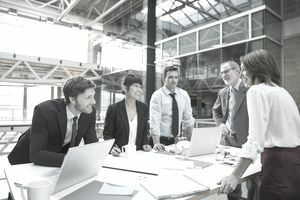 While an individual leader can use the nine-box to assess their own employees, it has real value is when a leadership team uses it as a part of a “talent review” to have a discussion about the entire organization’s collective talent. Leadership teams (often engineers or scientists) will often try to overcomplicate it, by adding more boxes, definitions for each box, and all kinds of bells and whistles. It hardly ever improves the process and often adds more complexity than value. Other than people’s time, or a paid facilitator, there is no cost to using the nine-box. There are other ways to assess potential – formal instruments and assessment centers are great, yet they are also expensive. While many will criticize the lack of objectivity in using a nine-box to assess performance and potential, most organizations can’t afford to send every manager through a $10,000 assessment center. It’s not about filling out the grid – it’s all about the discussion. That’s a critical point that beginner teams often lose sight of. Managers, in general, are not very skilled when it comes to assessing talent, and are very hesitant to discuss other manager’s employees, or hear feedback about their own. This tool helps managers have those conversations in a professional, productive way. While “candid and robust” is a good thing, without a framework, these conversations can get messy and sidetracked. With skilled facilitation, the nine-box provides a framework and roadmap to discuss each individual’s performance, potential, development needs, and development plans. It’s recommended that teams go into the talent review with a pre-determined, clear, consistent, definition of performance and potential. Sometimes those definitions don’t exist. Even if they do, they are often just words on paper not grounded in reality. By using this tool, teams have a chance to discuss what performance and potential means. In fact, for a lot of managers in the room, it’s the first time they’ve heard their own bosses’ expectations, so you’ll see them discreetly jotting down notes and assessing themselves. The accuracy of assessing performance and potential improves with multiple data points. Managers often have blind spots with their employees and are unaware of how they are perceived by others. These discussions can help shine a light on superstars and poor performers. In a functional or segmented organization, talent development is often one of the few things a management team can actually work on together. A talent review meeting uncovers both individual and organizational strengths and weaknesses. The nine-box serves as a needs assessment for development actions that need to be taken. Many organizations now use nine-box talent reviews to discuss and agree on individual development plans (IDPs) for each employee. The nine-box can be a very effective tool to facilitate a discussion around performance and potential. While it’s not perfect and has its inherent pitfalls, its advantages far outweigh its disadvantages. For specific instruction on how to use the nine-box in a talent review, see How to Use the Performance and Potential Nine-Box Matrix for Succession Planning and Development.